The Dalai Lama waves to worshippers during ceremonies at the Gandantegchinlen monastery in Ulaanbaatar, the capital of Mongolia, November 19, 2016. The day before the Dalai Lama’s November 18 trip to Mongolia, Beijing issued a “strong demand” to its neighbor to cancel the visit of the “anti-Chinese separatist” or face (unstated) consequences. The Dalai Lama would be making his ninth visit to the sparsely populated nation of 3 million people, just to China’s north. Previous visits triggered retaliation from China, including the temporary closure of parts of the Sino-Mongolian border. But in a press conference, the Dalai Lama slammed China for interfering with his travels. He also announced that the next spiritual leader of Mongolia, the Jebtsundamba Khutuktu, considered the third most important lama, after the Dalai Lama and the Panchen Lama, has been born. 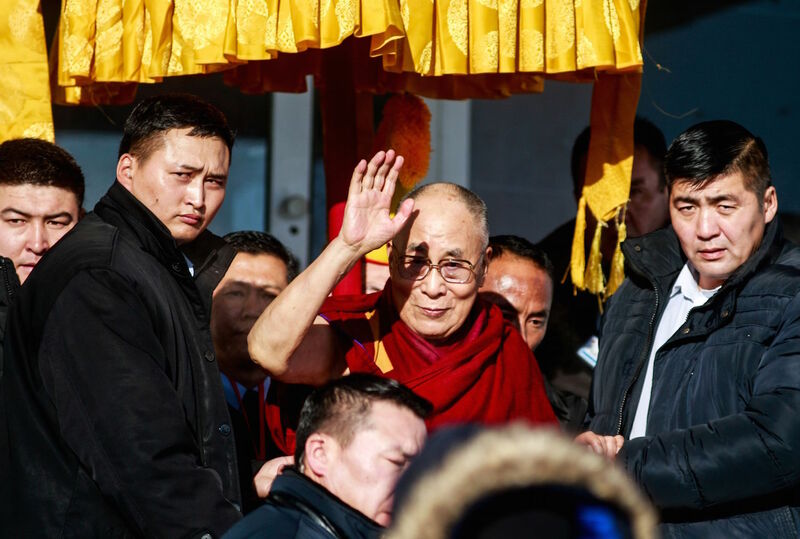 That controversial move is likely to anger Beijing, which has long sparred with the Dalai Lama over the right to appoint Buddhist reincarnations. After the Dalai Lama left on November 23, Beijing indefinitely postponed bilateral meetings between the two nations, casting doubts over Ulaanbaatar’s hopes to obtain badly needed soft loans and economic aid. President Xi Jinping has repeatedly spoke about the win-win nature of China’s rise. China’s outreach to its neighbors through its massive One Belt, One Road initiative promises regional economic growth, peace, and stability. And Beijing advertises equality and non-interference as hallmarks of its foreign policy: different, it says, from foreign policies of the old great powers. But Beijing’s efforts—and embarrassing inability—to force Mongolia’s compliance with its political demands expose a more sinister face of China’s friendship. The history of China’s relations with Mongolia shows that raw pressure and intimidation can backfire in unexpected ways. One particularly relevant example concerns Beijing’s efforts to sway Mongolia following the 1962 Sino-Indian conflict. In 1959, following the outbreak of an anti-Chinese rebellion in Tibet, the then 23-year-old Dalai Lama fled to India. Beijing never forgave him for leaving, nor forgave India for giving him refuge. Relations between Beijing and New Delhi, until then hailed as a shining example of peaceful coexistence, tanked. Border tensions escalated, and in October 1962, the two neighbors went to war in the Himalayas. Although China won the battle, the real challenge was to persuade the world that the Indians were the bad guys—a matter complicated by the reality that Beijing attacked India, not the other way around. The task fell to the founding father of Chinese diplomacy, Zhou Enlai, who spent weeks explaining China’s take on the conflict to disconcerted regional players like Indonesia and Sri Lanka. In December 1962, Zhou attempted to convince the Mongolians to endorse the Chinese point of view. The records of his dramatic encounter with then Mongolian Prime Minister Yumjaagiin Tsedenbal have recently been declassified by the Mongolian Foreign Ministry, and are now accessible online. They make for sober reading. Tsedenbal, who came to China to sign a border treaty and to ask for economic aid, seemed surprised when Zhou unexpectedly raised the subject of India. Zhou recounted the highlights of the Sino-Indian border confrontation, and condemned the Indians for selling out to American imperialism and for pursuing anti-Chinese policies. Tsedenbal reacted by saying meekly that he was sorry that China and India had quarreled. “I don’t understand what you mean by being sorry about the Sino-Indian conflict,” Zhou pressed. It was a matter of black and white: China was right, India was wrong. There could not be neutrality in the question. But Tsedenbal would not budge, telling Zhou that quarreling with India over an uninhibited strip of land in the Himalayas would only force the Indians to turn to the West, and that would not help China’s cause. Zhou nearly lost it: his face “twisted in anger,” noted the record-taker. After this inauspicious beginning, the talks rapidly went downhill. Tsedenbal asked Zhou to help resolve the problem of Chinese workers in Mongolia. These workers had become rebellious and were declaring strikes; would Beijing tell them to behave, and send more workers, which Mongolia badly needed? In response, Zhou connected the workers problem and Mongolia’s unwillingness to endorse China’s political positions. After this unpleasant encounter—the last time the two men saw each other—relations between China and Mongolia worsened. China curbed economic aid, and by 1964 had pulled out its workers from the country. Mongolia turned to the Soviet Union for protection, and the Russians sent an army, which they did not completely withdraw until after the Soviet Union fell apart in 1991. Tsedenbal remained one of the bitterest critics of China. It was on his watch that the Dalai Lama first visited Mongolia, in June 1979. What was behind Zhou’s embarrassingly ineffective performance? Yes, the Chinese Premier, generally known for his refinement and tact, was under pressure at home to comply with Mao Zedong’s radical leftist agenda. But his brutal effort to impose the Chinese viewpoint on a visiting leader—in this case a leader of a neighboring country, which, he knew all too well, depended on China’s largesse—had the opposite effect from what he probably intended. In the early 1960s, some in the Mongolian leadership advocated a softer line on China. But Beijing’s pressure made it politically impossible to defend closer ties with China: anyone doing so risked alienation as a sell-out and as an agent of Chinese influence. The problem was that the leaders of the Chinese Communist Party could not tolerate opposing opinions. Mao had brutally crushed domestic dissent. He applied the same yardstick internationally: one was either with him or against him; there was no middle ground to accommodate cautious neutrality like Tsedenbal’s. At the surface, it was all about equality and non-interference. But just below, there was the expectation that others would kowtow to your demands, and anger and retribution when they refused. Today’s China is vastly more powerful than China of the 1960s. But it is hardly more cognizant that bullying others into submission is not a useful method for winning friends, especially among neighboring countries, which are often suspicious of Beijing’s intentions. The Dalai Lama’s recent visit prompted soul-searching among Mongolian politicians, as the Vice Chairman of the Mongolian Parliament Tsend Nyamdorj, among others, publicly questioned the wisdom of taunting the dragon. But, like in the 1960s, Beijing’s heavy-handed threats make it politically difficult to defend closer ties with Beijing.